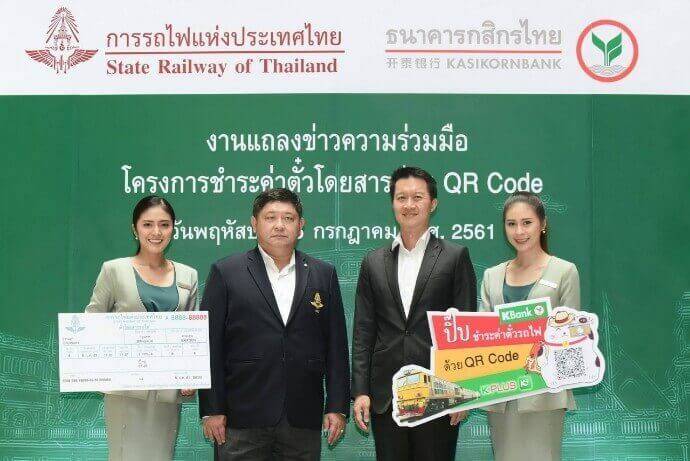 In Jul 2018, State Railway of Thailand (SRT) and Kasikorn Bank jointly announced the use of QR Codes to buy SRT train tickets. For the uninititaed, here’s what QR Code payments are. Around 80,000 passengers use rail transport services daily. The numbers is set to increase with Thailand’s booming tourism. Currently, 92 percent passengers use cash to pay their train fares. Only 6 percent passengers make use of credit cards. Hence, this move is made in response to ‘Cashless Train Society’, which is in alignment with Thailand 4.0 policy. To address these issues, QR Codes to buy SRT train tickets have been introduced. Passengers will be able to buy tickets without the need to carry cash. It will make the process faster and convenient. Note that you will need a smartphone and Kasikorn Bank’s mobile application to use the facility. SRT organised a training session for station officers on the use of QR Code to buy train tickets. It will facilitate convenience for passengers at ticket counters of any station. Till now, 140 dynamic QR Code generating machines have been installed at main stations across the nation. These include Hua Lamphong station, Nong Khai, Chumphon, Ubon Ratchathani, and Chiang Mai. Hua Lamphong has 14 machines (the highest number on any station). Also see how QR Codes are used in Thailand. To conclude, by using QR Code to but STR train tickets, the payment process will become faster, safer and more convenient, and reduce STR’s cash counting expense. However, the benchmark for success is 1 million passengers using the QR Code method. Smaller stations can get EDC machines only after success of existing ones.